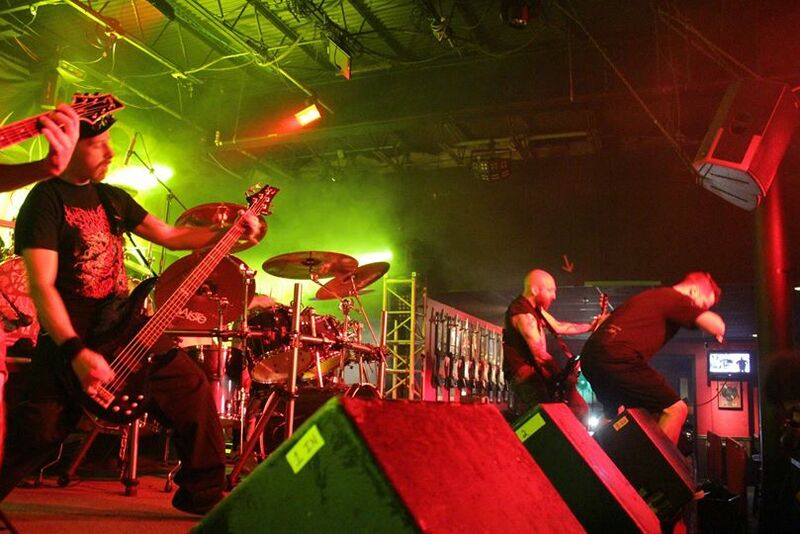 SUFFOCATION/KATAKLYSM/JUNGLE ROT Live In Houston, Texas With Photos! This tour package was really something. It isn't very often that you get to see a show with five established death metal bands all on one package. To say I was looking forward to this, and to review this for you all, was an understatement if there was one. And go figure, on the way to this show, which was on the other side of town, the traffic was horrendous. 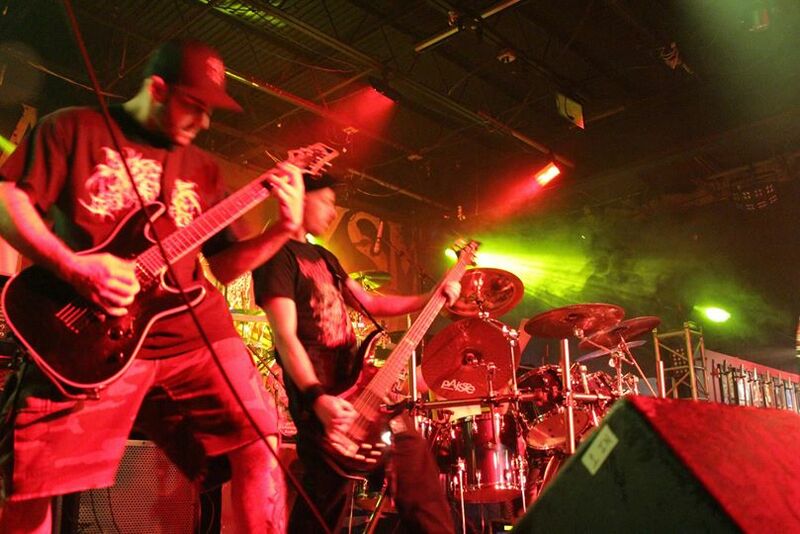 So, by the time I picked up my photographer and got to the show, we had missed INTERNAL BLEEDING's set. I wasn't too happy about this, but I had the chance to see these guys not much earlier beforehand at a big death metal festival here in Houston. So, we get to the show and PYREXIA starts only about 2-3 minutes after we arrive. I guess we weren't the only ones who had trouble getting to the venue because of traffic, because about halfway through their set, people finally started showing up. PYREXIA sounded good, and they were LOUD, especially considering that there was back line from the headliners behind them, so they didn't use a lot of equipment. Their sound was solid, and the few people there were into them musically, and the even got a few people moshing for them. However, the vocalist's attempts at stage banter fell flat. There was even one point in their set where he said that he was glad people were out on a Tuesday night. Considering the show was on a Wednesday.....you know death metal fans, sarcastic as they can be, shouted out "It's Wednesday dude!". Nothing huge, just playful heckling. Aside from this, both the people who were there at the beginning of their set, as well as the walk-ins, liked them. Next, was JUNGLE ROT. I was probably most excited to see this band, just because I had never had the chance to see them before (the other two headliners I had seen before). And they were every bit as good as I pictured them being. They were loud, ferocious, and aggressive. And the crowd loved it; after the first song or two, mosh pits erupted and continued up until the time they finished (and between taking notes, I hopped in. Who says I can't let loose because I am reviewing the show?). Around the time they started, the crowd really, finally started to show up, and by the time they got done, the venue was packed. KATAKLYSM got ready to take the stage, and all of the equipment in front of the stage from previous bands was removed. There was a little bit more time before their set compared to the change-times of the openers, but it wasn't too ridiculous. So, I decided to grab some drinks before their set. I thought a PYREXIA was loud.....but for the rest of the night, the show was extremely loud. The sound was still clear regardless, and KATAKLYSM really tore the place apart. Their stage presence was great, their set flowed with almost no gaps between songs. And despite the fact that there wasn't as much movement between songs as for JUNGLE ROT, the crowd was really enthusiastic and met each brief gap between sounds with loud, thunderous applause, shouts and horns raised. And it continued that way the entire time they played. The last time I saw them a few years back, the band was good, but they were not this tight-knit. They have really honed their craft as performers, both as players and presence-wise, and I was really impressed. SUFFOCATION. One of my favorite death metal bands ever. The last time I saw them, they still had their original vocalist and drummer. Mike Smith (their drummer) not being behind the kit any more wasn't unknown to the fans. But......Frank Mullen not touring with them was something the fans didn't know about. So, some of the audience, before the set, was less than enthusiastic when they found out about this. 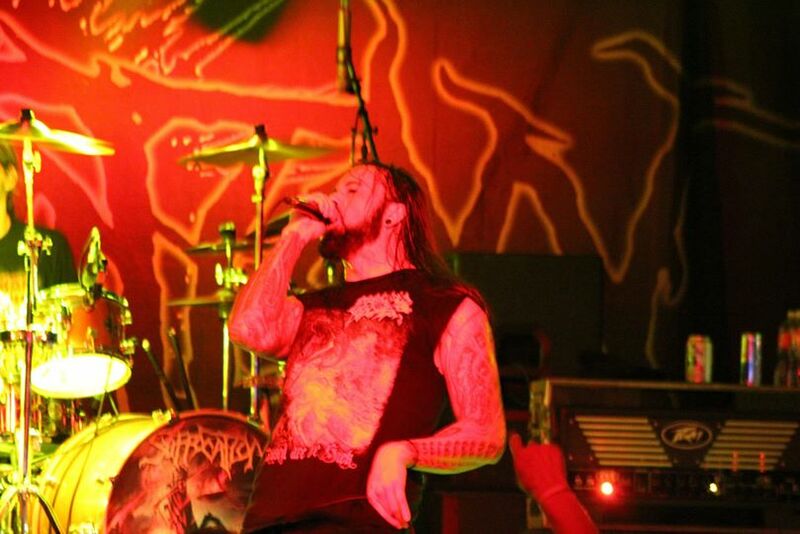 However, once SUFFOCATION played, any doubts were cast aside. The band was AWESOME. They laid absolute waste to that place, the set list was PERFECT, and the audience was loud, violent and insane. Kevin Talley (who has been in so many damn bands I can't even list them all here, but he is most well-known known at the moment for DYING FETUS) was flawless in his drumming. The man is seriously nothing short of amazing, and if anyone has any doubts as to whether or not he can fill Mike's shoes, take it from someone who is picky, he can do the job. If anything, seeing him was probably the highlight of the set. Not to say the rest of the band isn't amazing. You think the riffs are heavy on their albums? It doesn't even compare to them live. Especially on "Liege Of Inveracity" near the end of then set......there were so many people violently head banging that I wouldn't be surprised if some of the showgoers had to go to a chiropractor after the show. A great show. A great tour package. I can't thank Nuclear Blast enough for hooking me up with this. The whole night was a ton of fun and I had a blast. Go see any of these bands when they play in your town.